SAN DIEGO, Calif. (CBS 8) - A group is protesting against what it calls the "tax-and-spend" approach of federal, state and local political representatives. 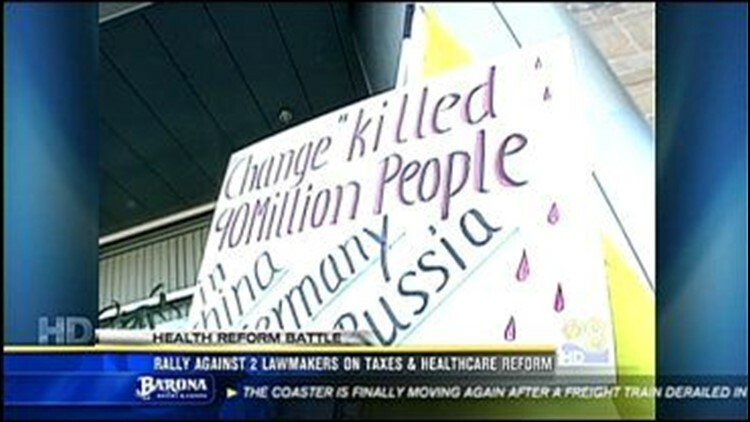 Members of the Southern California Tax Revolt Coalition held a rally today. They demonstrated outside the offices of Democratic representatives Susan Davis and Bob Filner. They accuse the lawmakers of not listening to their concerns and shoving healthcare reform down their throats. "We're down here expressing our concern in the direction this government's going. We're being taxed too much, we're losing our freedom,"
"The Constitution does not these clowns to control my life, my health, and my income. I wouldn't allow and I wouldn't stand for it,"
The offices of Davis and Filner told News 8 they've held healthcare town hall meetings, read emails, letters and faxes to hear the concerns of San Diegans.